If you haven’t seen the gorgeous photo of my recipe for red lentil sambar taken by Susan at Fat-Free Vegan, be sure to check it out — she posted the recipe, too. This particular sambar recipe is in Vegan Fire & Spice and is special to me for several reasons. I adapted it from a family recipe given to me by my dear friend, Sangeeta Kumar, who got it from her aunt Anshu. Another reason is that I now live in an area where there are no Indian restaurants and it’s great to have some yummy Indian recipes handy when I need a fix. Heat the oil in a skillet. Add the scallions and cook until softened. Add the potatoes, peas, and curry paste and cook until well mixed and hot. Divide the mixture evenly over half of each of the tortillas. Fold the tortillas over and place them, two at a time, in a large non-stick skillet or griddle over medium-heat. Cook until lightly browned on both sides, turning once. Keep them warm while you cook the remaining dosadillas. Serve them whole to be cut with a knife and fork, or cut them into wedges to eat out of hand. Note: The mashed potatoes can come from a variety of sources: you can plan ahead and make extra baked or mashed potatoes for dinner the night before. If there was ever a reason to make extra potatoes, this is it. If you don’t have cooked potatoes on hand, you can quickly microwave some, and then simply mash them with a potato masher, adding salt and pepper and a little margarine. I decided to make my special Valentine’s Day dinner a day early so it would be available for anyone who may want to make all or part of it for their own Valentine celebration. There’s nothing quick and easy about the prep. Lots of cutting things into heart shapes, which is time consuming, but, hey, that’s what makes it special. I have heart-shaped cookie cutters somewhere, but I can’t find them since moving last Spring, so I cut everything free-hand. 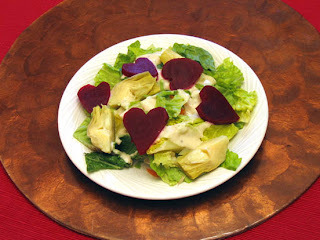 The “Here’s My Heart Salad” features artichoke hearts, romaine hearts, hearts of palm, and heart-shaped red beets. You can use your favorite dressing -- I used a vegan Caesar, but a balsamic or raspberry vinaigrette would be nice to cast a rosy glow. For the Wellingtons, I cut seitan and portobello caps cut into heart shapes and sautéed them and let them cool. I then stacked them and wrapped them in a piece of puff pastry that I shaped like a heart and baked them at 425 degrees for about 20 minutes. 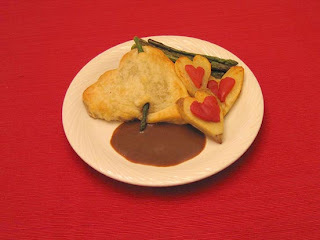 At the last minute, I decided to pierce the pastry with an asparagus “arrow” (cute, huh? My husband thinks I go overboard.) The sauce is a red wine sauce. 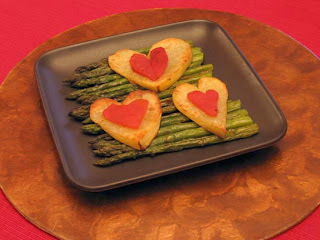 The heart-shaped potatoes were cut out of a large russet and roasted with olive oil and salt and pepper. I placed a roasted red bell pepper heart on each slice of potato. For dessert, I made a small plain cheesecake and then enrobed it with melted chocolate. 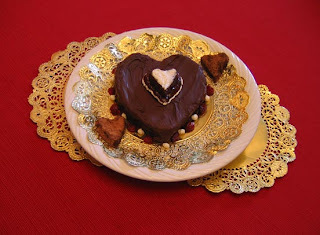 The garnish on top is some heart-shaped cherry jam topped with a chocolate-cherry truffle, that I shaped into a heart, and “iced” with vegan cream cheese. More truffles and some dried cherries complete the effect. Okay, so I told you about my special dinner – now I’d like to hear about your Vegan Valentines celebration. For me, Valentine’s Day came early this year. I’m feeling the love from how word about Vegan Fire and Spice is spreading around the blogosphere. Check out the great review on Soul Veggie. On Eat Air, you can find a photo and comments about my recipe for Tofu & Broccoli with Hoisin Ginger Sauce. 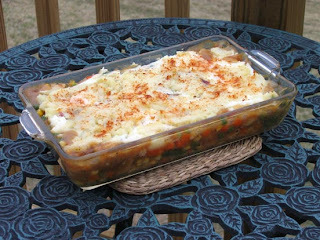 Vegalicious gave VF&S a nice shout-out as did Amy at the VegCooking blog. (Links to these sites are in my blogroll.) 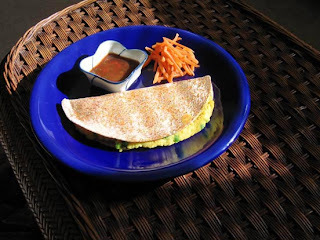 In her February newsletter, Vegetarian Kitchen Recipes & News, fellow cookbook author Nava Atlas has posted several recipes from Vegan Fire &Spice. Vegan Yum Yum and several other notable bloggers, have added a link to my new blog to their blogroll – and my blog (and new book) have only been around for about a month! Thanks to all for the great feedback and your kind words – better than a box of vegan chocolates! After a week of unseasonably warm temperatures, the cold weather is back and along with it, my desire for a comforting stew. I wanted to use my last remaining butternut squash that I picked months earlier from my now-frozen vegetable garden. A richly flavored African stew sounded like a good match. 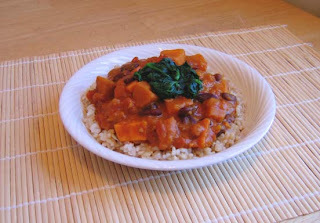 I adapted this stew from the recipe for North African Pumpkin Stew in Vegan Fire and Spice. In straying from the recipe, I enriched the sauce with a bit of peanut butter, added a lonely sweet potato that was languishing in the fridge, and topped it with some steamed baby spinach, because we love our greens and also because spinach goes so well with the flavors in this stew. Served over brown rice, the result was a delicious one-dish meal that tasted even better when we had it for lunch the next day. This yummy stew was a fitting tribute to my last garden-grown squash from the fall. The recipe was adapted from Vegan Fire & Spice. If you don’t like heat, just omit the chiles. Heat the oil in a large saucepan over medium heat. Add the onion, cover, and cook until tender, about 7 minutes. Add the garlic, chiles, ginger, cinnamon, cumin, and allspice, and cook, stirring, for about 2 minutes. Add the squash and sweet potato and toss until evenly coated with the spices. Add the tomatoes, tomato paste, sugar, water, and salt and pepper to taste. Bring to a boil, then reduce the heat to low. Add the beans, cover, and simmer until the vegetables are tender, about 45 minutes. A few minutes before serving time, remove about 1/2 cup of the cooking liquid and place it in a small bowl. Add the peanut butter and stir to combine, then stir the peanut butter mixture back into the stew. To serve, spoon some rice into the bottom of shallow serving bowls. Top with the stew and place a small mound of steamed spinach on top. Thankfully, Robin Robertson understands that recipes don’t need to be complicated, voluminous, or inaccessible to be delicious....The simplicity of these 150 recipes is what makes them perfect. If you think being vegetarian is boring, then read this book! It’s full of mouth-watering recipes that are quick and easy to prepare, making it a perfect introduction to vegetarian living. People who rarely cook but wish they could put more time into homemade meals will find Quick-Fix Vegetarian a genuine treasure. Most people live a hectic lifestyle these days, and any quick-and-easy vegetarian cookbook is greatly appreciated. Valentine's Day Dinner -- Over the top? I must be a romantic at heart, but there’s something about Valentines Day that makes me want to prepare what some may consider an over-the-top theme dinner. Each year I try to outdo myself, setting parameters such as all the food has to be red, or all the food has to be heart-shaped. One year I tried for both, and it was a bit extreme, even for me. Let me know what you think of my menu or share one of your own.